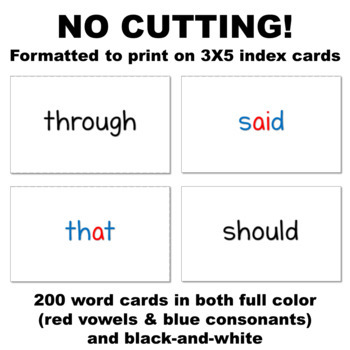 Whether you call them sight words, snap words, or just high-frequency words, these 200 word cards will be the easiest you’ve ever printed since they are formatted to print on index cards and there is NO CUTTING! The words can be printed and ready to use in minutes by using basic, 3X5 index cards instead of papers that need to be cut apart. The cards print best if you are able to hand feed or have an automatic feed with an adjustable guide to fit the width of the cards. 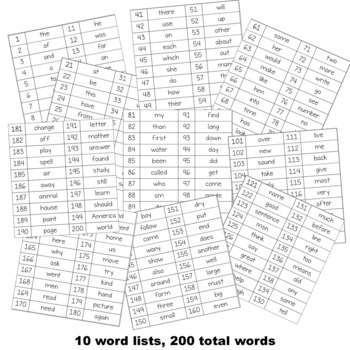 All 200 words can be printed with blue consonants and red vowels or with all-black letters. The sections are broken into sets of 20 words each and each section includes a numbered word list. 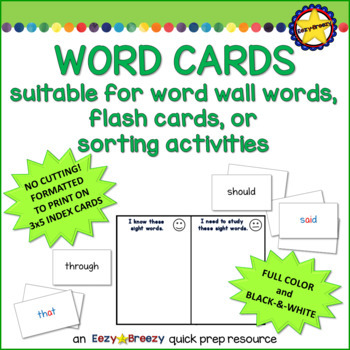 These word cards are perfect for use on word walls or as flash cards. 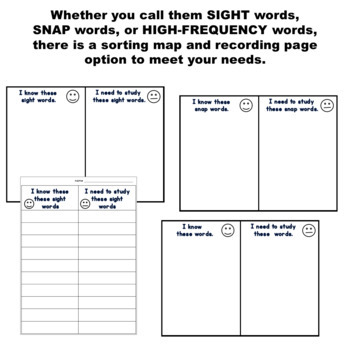 There are also three options for sorting mats and matching student recording sheets that can be used for independent practice.